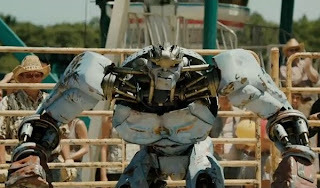 Scottscope: Trailer Review: Get Ready To Be Bludgeoned By Real Steel! Trailer Review: Get Ready To Be Bludgeoned By Real Steel! Having grossed over 1.5 billion dollars worldwide with only two entries, it was quite obvious that the Transformers films would eventually birth a number of like minded properties. The ultimate question remained what would those properties be, exactly? It appeared with the advent of toy line/cartoon adaptations such as Alvin & The Chipmunks, G.I. Joe and the Smurfs that we already had our answer. Amazingly, the Cybertronian wars would as dramatized by Michael Bay and company would also foster a demand for more robot themed properties. With the upcoming Real Steel, it seems that the Transformers tree has born some strange fruit indeed. Real Steel is a big screen adaptation of Richard Matheson’s short story Steel, which had previously been adapted for television as an episode of The Twilight Zone. It’s also, in many ways, an unofficial big screen version of the game Rock 'em Sock 'em Robots. The story centers around washed up prize fighter Charlie Kenton (Hugh Jackman), who gets a second shot at the title via as unexpected technological development. Giant robots have supplanted human beings in the boxing ring, thus taking over the sport. Charlie begins to promote minor league bouts between robots. When he falls on hard times, he teams up with his son Max in hopes of building and training a mechanical pugilist that will one day become a champion. 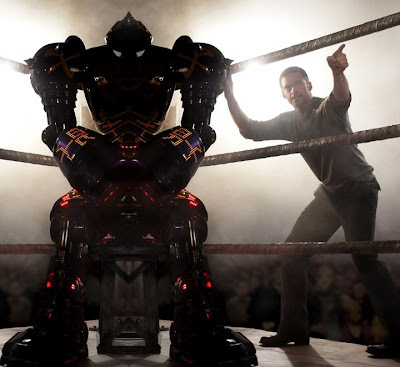 Real Steel is directed by Shawn Levy and produced by Steven Spielberg & Robert Zemeckis. It’s become quite clear at this point that Spielberg has a robot fetish, and god bless him for it. Though his own films have taken a darker turn as of late, he still hasn’t completely lost the childlike spirit that made him a household name. Levy has absolutely nothing on his resume that will excite fandom. The concept is the star here, more so than whoever is onscreen or in the director’s chair. This is basically a Rocky sequel done with visuals from the two Transformer films. The fact that robots will be beating the crap out of each other ensures there will be no bloody violence, leaving parents free to take the little ones. This is an easy sell for fans of action and high concept sci-fi. The trailer wisely presents the film to be exactly what it is: a kid’s movie for adults. The camera work is straight out of a number of tournament style martial arts and boxing films, right down to the seedy settings. Despite the inherent silliness of the concept, the film seems to be playing it straight faced. The FX are reminiscent of Transformers, though the boxing motif might result in more coherent action scenes. The story will undoubtedly be both familiar and light weight. In short, this looks like fun so long as it doesn’t take itself too seriously. Something tells me that many will end up preferring it to the third Transformers film. Either way, count me sold.